How would anything get done without a boss? What is the workplace structure? Workers’ Self-Management is exactly what it sounds like — workers controlling their own workplaces, answering to nobody other than themselves, and also to their fellow workers. Everybody involved in making the workplace’s decisions is on an equal footing: one person, one vote. This does not mean that every decision is made collectively. If something only affects one worker, then that worker can make the decision themselves. However, whenever a decision affects multiple workers, then all affected have an equal say in deciding things. When you have a boss constantly telling you what to do, you feel very disempowered at work. Hierarchical management drains the lifeblood of the worker and leaves them feeling alienated from their job. This is why people often complain about their jobs. This sense of disempowerment leads to people being “lazy” and not working as well. Let’s face it, nobody likes it when someone else tells you what to do and you don’t have any say in the matter. In the sphere of work, if you disobey your boss, you are likely to be left without a job. Contrast this nightmare with workers’ self-management. In workers’ self-management you have as much say in how things are run as every other worker. 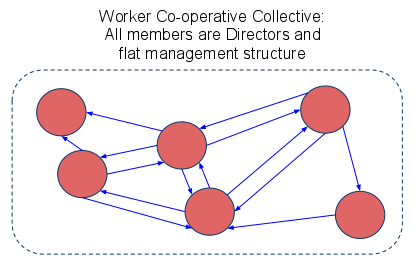 A system of shop floor direct democracy is implemented in which each worker affected by a decision collectively decide upon the decision. In small workplaces, this is very easily done by using a simple collective structure. In larger workplaces, this can be done very easily by dividing workplaces into departments. The departments could be divided based on the type of work being done. They would consist of the teams of workers who work together in day-to-day tasks. Each department would function similar to a small worker’s collective. 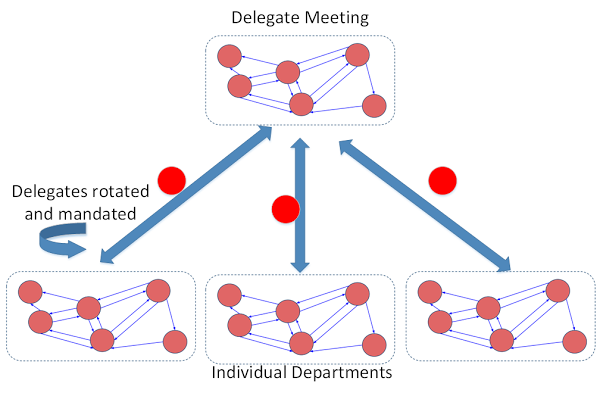 When workplace-wide decisions must be made, a delegate from each department could be sent to a meeting of all the departments. The delegate would have no power over their individual department, but would instead convey the wishes of their department as previously agreed upon by those in it. The delegates would be frequently rotated so that no one worker could gain too much influence over the others. The decisions of the delegates are subject to the democratic approval of the workers at the workplace, and in this way are mandated.